Jason E. Kaplan - Gunter Group employees working at their office headquarters in Portland. He soon met Mike Gunter. It was 2011—Mike had just opened his consulting firm and hadn’t yet made his first hire. Mike asked Bader to lunch. Seven years later, Bader is a Principal Consultant at The Gunter Group. He went from zero consulting experience to becoming a strategic advisor for the firm’s major clients—some of whom have upwards of 30,000 employees. And now, he is taking on the role of Market Leader for the firm’s Portland team. Ashleigh Gunter joined the firm in 2014 as the other Partner in The Gunter Group. Before founding and building the firm, Mike and Ashleigh had over 50 years of combined consulting experience (they met while working at Deloitte Consulting). They loved the work but were less fond of the typical consultant lifestyle and its incessant travel. Upon opening The Gunter Group, they set out to create a business consulting firm that was unique. Beyond those characteristics, The Gunter Group seeks out one additional trait: a passion for serving the local community. A majority of employees are actively involved with non-profits (Bader founded Checking for Charity--a hockey tournament nonprofit—as well as Vetwork PDX—a networking group for veterans; Ashleigh sits on the board at the Dougy Center, which serves grieving children). The company often donates to charities (Gunter Group made Portland Business Journal’s “Most Generous Corporate Philanthropists” in 2018) and performs pro-bono work for cause-driven organizations. Their “non-traditional approach” has paid positive dividends. The Gunter Group made Portland Business Journal’s “100 Fastest Growing Private Companies” in 2016. Many major clients have remained clients since their first project. 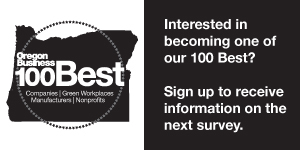 But more important to the company, they’ve made Oregon Business Magazine’s “100 Best Companies to Work For in Oregon” the last five years and have never lost an employee to a competitor. And their proudest achievement? In a Gallup survey on employee engagement, they ranked in the 99th percentile of companies. According to Ashleigh, many people like coming to work. But The Gunter Group’s goal has always gone beyond satisfaction; they want their consultants to truly care about the outcome of the business. The question is: How does a company cultivate that level of engagement? Yet cultivating engagement goes beyond just professional growth. For example, Mike and Ashleigh will send a bottle of champagne for an employee’s special anniversary. One time, they sent a cleaning service to a consultant’s house because she was overloaded with responsibilities. By investing so deeply into their relationships, Mike and Ashleigh have tapped into the essence of engagement: You get people to care by caring about them first. “This isn’t about creating an empire—it’s about our people,” said Ashleigh. “Our growth is just the outcome of how we treat them.